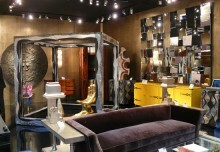 New York, NY—Todd Merrill Studio will be participating at the Winter Antiques Show at the Park Avenue Armory in New York. The gallery will usher in a new façade of the fair with an exhibition of historically inspired works by four contemporary women artists. While the women artists work with definitive 21st century techniques, their shared aesthetics make reference to past traditional forms – from ancient Roman glass to the Rococo ceramics. Following a successful exhibition at Todd Merrill Studio, the gallery will exhibit recent works of Brooklyn based artist Shari Mendelson. Using recycled plastic; Mendelson creates sculptural works of art that reference the legacy of past civilizations while addressing modern issues of sustainability. By transcending their original utilitarian form to appear as fragile glass, the works express a timeless continuum of what we, as a culture, leave behind. 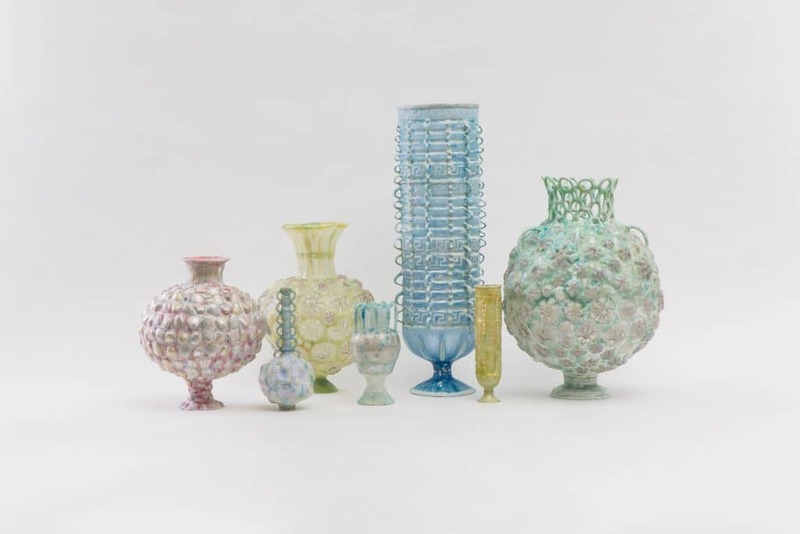 Mendelson spends countless hours studying ancient glass and ceramic vessels and with equal parts reverence and play, she reinterprets these in plastic. Conceptually, Mendelson is interested in the relationship between the rare, ancient works that we value in museums and our contemporary throwaway plastic culture. Formally, her interest is in the exploration of structure, form, scale, texture, color, and translucency. 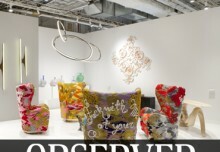 The resulting vases and pitchers are whimsical, diaphanous, rough-hewn, and surprisingly elegant. Mendelson’s work resides in several public collections, including The Cooper Hewitt National Design Museum (New York, NY), The Hood Museum, of Art (Hanover, NH), The Museum of Old and New Art (Tasmania, AU). Her works can be found on permanent exhibition at The Museum of Fine Arts Boston (Boston, MA) and The RISD Museum (Providence, RI). 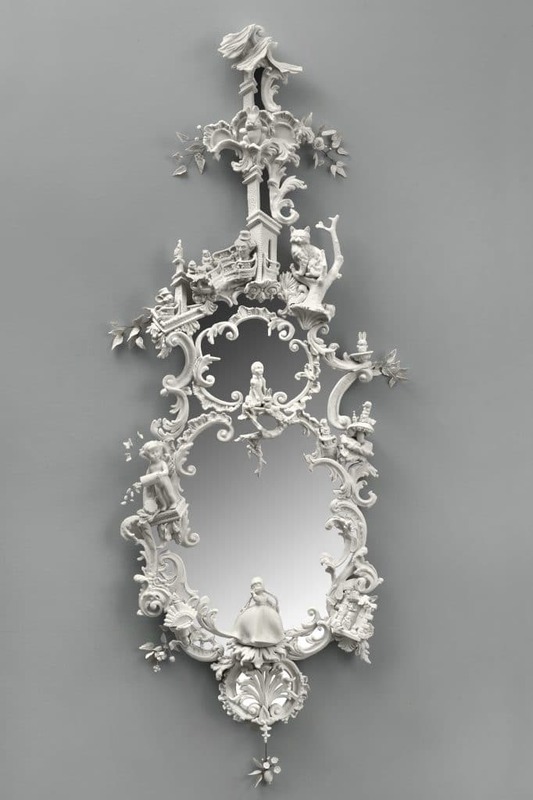 The gallery will also debut Beth Katleman’s newest work, White Rabbit, a unique handmade porcelain mirror that offers a contemporary reinterpretation of a Chinese Chippendale mirror. Inspired by the Lewis Carroll’s whimsical books, “Alice in Wonderland” and “Alice Through The Looking Glass,” Katleman combines Rococo opulence with a dose of pop culture, and the tradition of luxury porcelain with elements that are decidedly lowbrow. The porcelain figures are hand-cast from the artist’s collection of flea-market trinkets and kitsch toys; bringing their own histories, that emphasize a surreal, otherworldly quality. As pastoral scenes dissolve into a dark fairy tale, Katleman’s signature dark humor comes through; creating a tableau that is seductive, playful, and unsettling. 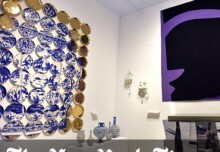 Katleman’s work has been exhibited and resides in prestigious private and public collections worldwide, including the M.H. De Young Museum (San Francisco, CA), The Museum of Art and Design (New York, NY), The House of Christian Dior (Hong Kong and London Flagships), and The Nike Collection (Portland, OR), among others. Also on view are works by artist Sophie Coryndon, whose work is inspired by elements of the natural world and rooted in historical aesthetics. Imaginative and innovative, Coryndon has forged a successful career of combining traditional craft skills and specialist finishing techniques in a fine art realm. Often material and process driven, employing multiple disciplines such as bronze casting, painting, embroidery and sculpture, her work has found a large audience with collectors and designers internationally. Coryndon spent her formative years working alongside her father at the legendary Coryndon Cabinet Makers. 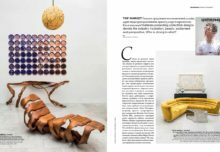 Coryndon takes the traditional applications of her royal cabinetmaker father and expands them through experimental processes that push the possibilities between decorative and fine art. Hoard II and Hoard III, two 16 x 12 inch hanging wall plaques masterfully explore the exquisite nature of honeycombs using cast bronze, gold gilding as well as precious and semi-precious stones. Coryndon became interested in bees after reading about the rising detriment facing the insects around the world today. In an effort to capture abandoned “ghost ship hives” Corydon is using lost wax bronze casting. Though bronze is regarded as a robust medium, in Coryndon’s hands the material takes on a jewelry-like delicacy. 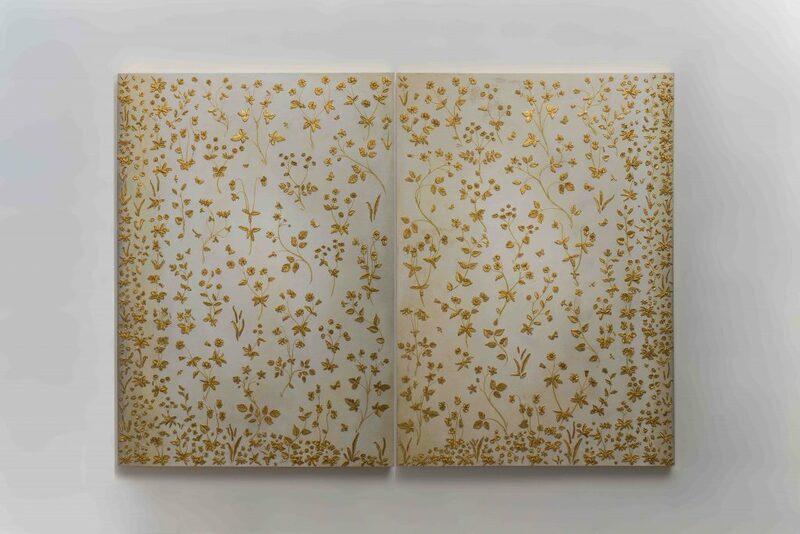 Book of Flowers, a large diptych measuring 72 x 102 inches, takes its inspiration from 16th century tapestries and intricate gold-work embroidery. The magnificent piece details a swathe of wildflowers and is adorned with hand-tooled flowers that are cast and gilded before being worked into their final composition on a polished ivory gesso background. 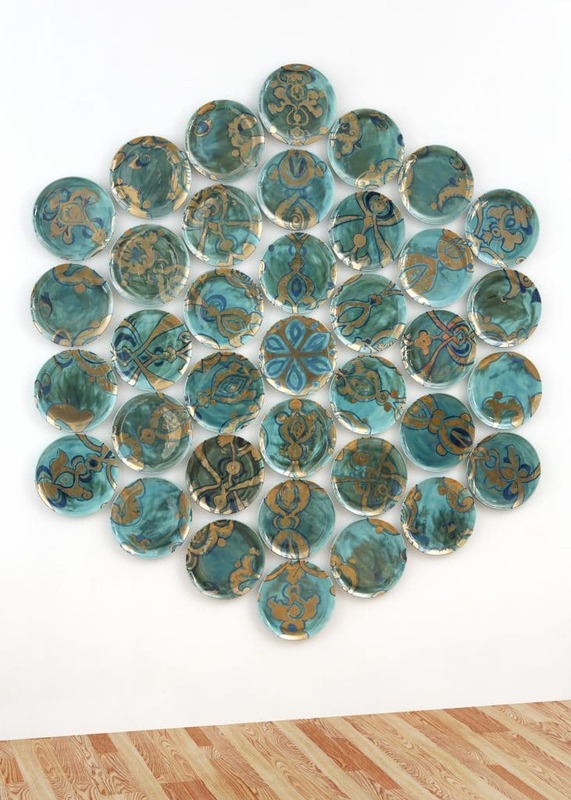 Furthering the contemporary commentary on the traditional crafts, the gallery will debut Molly Hatch’s newest plate painting installation, Aria, based on an early 13th century Islamic plate from the collection of the Metropolitan Museum. Innovations in early Islamic luxury ceramics from this time include “minai ware” which introduced polychrome enamel designs and gilding onto previously glazed and fired pottery. Composed of 37 painted porcelain plates installed in a geometric honeycomb pattern, each round surface serves as a canvas for the artist’s brush strokes; together, the plates reveal the intricate abstract floral motif of its source material. Its vibrant color and gold accents reference “minai ware” while the composition of ceramic plates is decidedly contemporary.